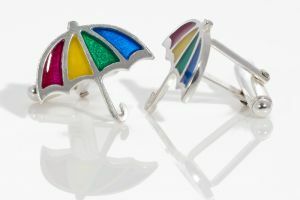 Silver umbrella cufflinks hand coloured using resin. Kate Wimbush creates wearable, figurative jewellery from silver and 9ct gold, accented with colourful resin. She is inspired by her life, memories and all things miniature.